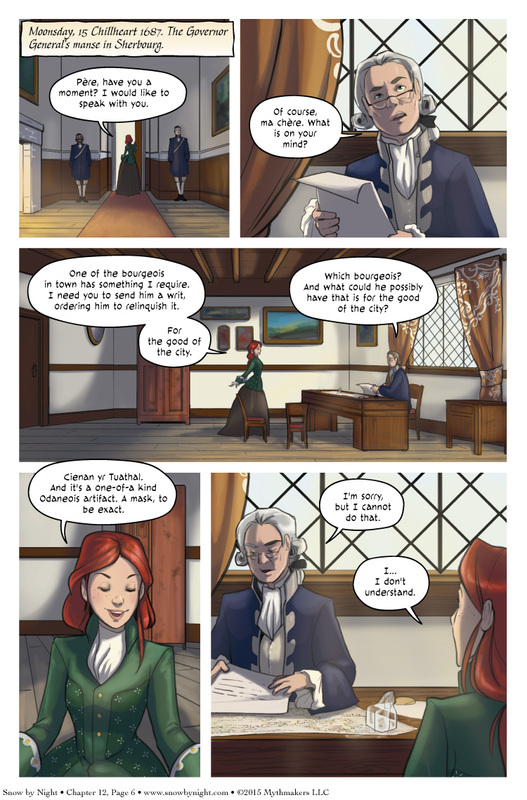 Vivienne visits her father, who also happens to be the Governor General, on Chapter 12 Page 6. This conversation might not go the way she wants. When I asked Julie to draw this page, I wanted to show wealth and power, but it’s still the colonies. Little splashes of baroque styling would be present, but it should have a hint of the rustic to it. I think she succeeded marvelously. To see why I was rushing to get all the maps done, please vote for Snow by Night on Top Web Comics. I have one more Almanac update this Friday, which will be a map of Aradie. After that, I’m taking a two-week break for the holidays. The next page goes up on Jan. 4. See you then! Hoho, kind of funny seeing Vivienne not getting what she wanted, and i’m curious to know why her father can’t asks Cienan to give the mask….How much power does that man possess!? Maybe it’s just integrity that’s stopping him? Luckily, she happens to know a daring scoundrel-type person. Nothing bad could happen, of course…. Meddling with forces beyond their understanding would do it the smart way, like taking as many security measures as possible. Many preciously have tried this tactic. Promptly followed by stuff thrown at them. The last one who tried to get him to relinquish it almost got a spear through the eye.